DecoPro / DecoPro XL / DecoProXXL, professional ambisonic decoders, since 2004. For info, contact us via info [at] gerzonic.net. The DecoPro line is a decoder family for the VST platform which proviedes 2nd order (or only first order if desired) ambisonic decoding. It uses the decoding equations published by Furse and Malham. You can comfortably edit and store different rigs as presets, also irregular. It features respective order weighting for all orders (0th, 1st, and 2nd), giving the possiblity to do both extremes ("strict soundfiled" or "controlled opposites") and everything in between. It has automiatic delay compensation for irregular arrays. The coordinates are specified in meters for (x, y, z), the correct amount of delay is calculated autmatically for the speakers which are nearer to the center. The volume of each speaker can be adjusted individually for doing manual correction of e.g. 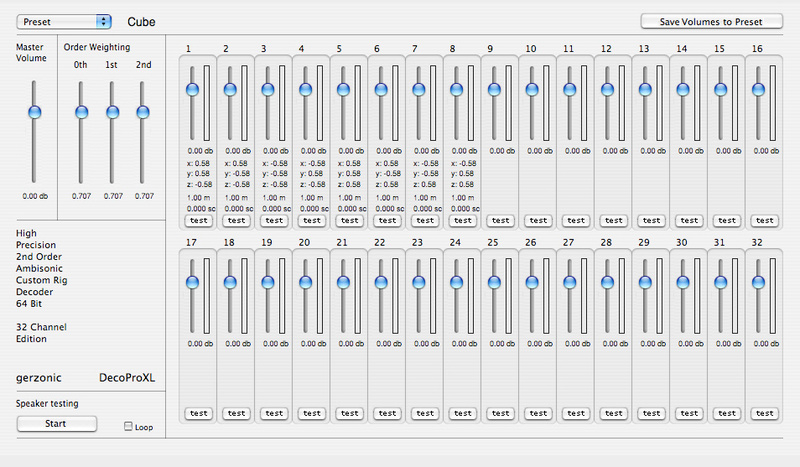 a difficult room, the volume settings can be stored in the preset. DecoPro handles the decoding part only. 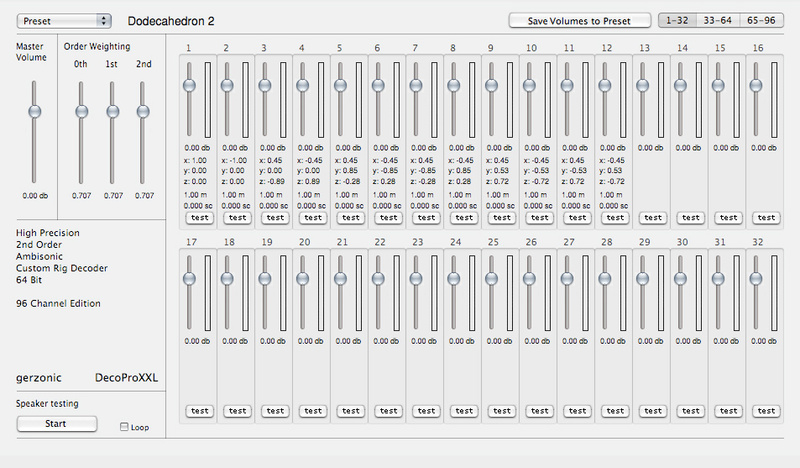 It is most useful if used in a modular host as MaxMSP, AudioMulch, or Bidule. DecoPro is available in three configurations where only the number of channels is different, DecoPro: 16, DecoProXL 32, and DecoProXXL 64. Single licences are available, you will get both binaries for Mac and for PC, if you wish so. Site licences are available. Besides the above mentioned features, DecoPro also has a nice speaker testing feature, where you can test either individually selected speakers or the whole rig repetitively.